Are you sour candy obsessed? If you walk into a candy store and make a beeline for the sour worms, sour straws and sour patch kids, then you’ll want to read this tip… To keep your craving at bay and avoid that sour candy sugar crash, Kelly recommends making a trail mix of nuts with golden berries. “Golden berries are one of my favorite little tricks to tell my clients about… They are very tart like your old school sour patch favorites,” says Kelly. Make a bowl of trail mix and set it on your kitchen counter in place of processed, refined-sugar-laden candies. Also, this snack is a great one to make and pack up in a small baggie for the movies, a concert, or any event where you think you’ll get a sweets craving. Are you a gummy bear lover? Gummy bear lovers… You are in luck! Kelly recommends making your own healthy gummy bears at home. Just mix up a few tablespoons of grass-fed gelatin, lemons or lime juice and a little local honey, and pour into a gummy bear mold (like this one). With these ingredients, you can easily make a healthy batch of gummy bears without high fructose corn syrup, corn starch and preservatives. It’s a win-win! Are you a self-proclaimed chocoholic? 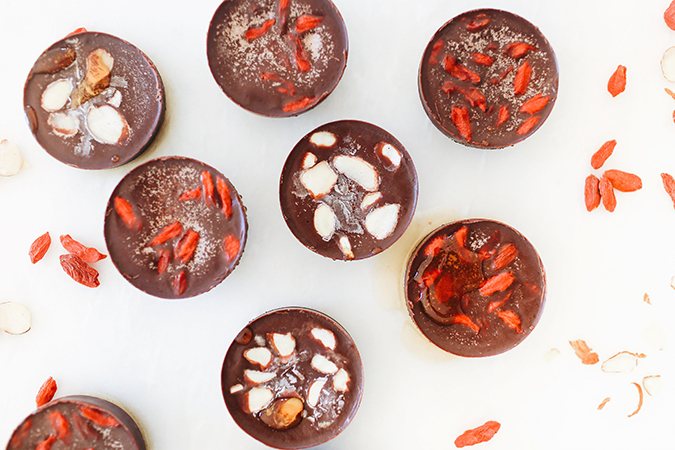 Chocolate lovers, don’t fret—we have good news for you. Kelly is a big fan of chocolate… “It’s great,” she says. “As long as you pick a low or no-sugar-added bar that’s organic.” Kelly recommends Theo or Primal bars. And better yet, for those of you who like to get creative in the kitchen, you can make your own freezer fudge! Follow Kelly’s recipe here to make a batch of your own. It’s delicious and is sure to satisfy those chocolate cravings. Kelly’s entire mentality involves replacing, not depriving. Which is definitely something I can get behind, especially as we head into Halloween and then the holidays. I hope you learned something new in this post that will help you keep your healthy habits going strong this month! And be sure to stay tuned for some more healthy holiday tips coming this season. What are your best tips and tricks for staving off sugar cravings? Do you have a healthy snack you turn to when you get a sweet tooth? Let me know in the comments below. And thanks again to Kelly LeVeque of Be Well by Kelly for sharing her healthy tips with us today!